Great watch, feels and looks great. A must have for any watch collection. A town in northern Italy, Maranello has been a home to Ferrari since the 1940s. Today Ferrari continues to develop highly distinctive and attractive collections with a real sporting pedigree. 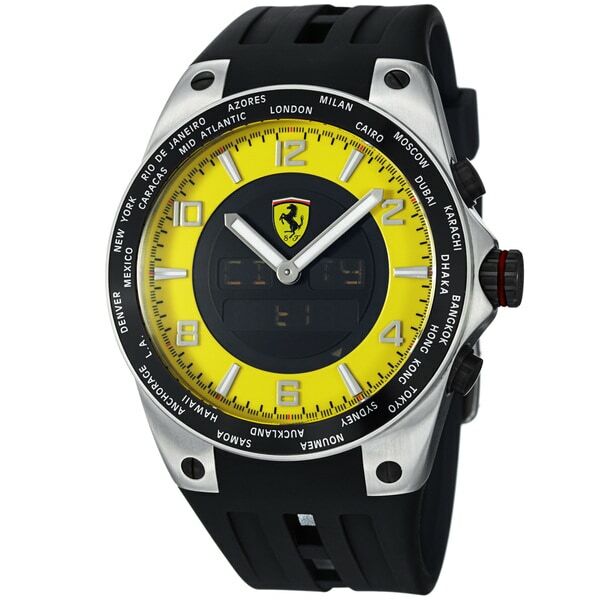 This watch features a yellow digital dial and a black strap. I bought this watch for my husband. He absolutely loves it. I was drawn to the bright yellow. He loves the features and style. Gave to my son for his birthday and he loved it! "I cannot figure out how to set this watch. Any ideas? The instructions are horrible." Pull out the crown and the watch will now be in setting mode. Press the bottom push button to change to various setting modes, and the top push button to set them. After pressing the bottom push button 3 times you should see on the top left of the screen “T1” which is time zone 1, and the hours on the bottom left of the screen will be blinking. You will now be able to set the hours by pushing the top push button. then press the bottom push button again to move the setting mode to the minutes, the minutes will start blinking and you’ll be able to set it by pushing the top button. You can go through all the setting modes by pushing the bottom push button and set them by pushing the top push button. After you’ve completed the settings, you can push in the crown. Push the center crown button inwards to move the display from mode to mode (T1, T2, Alarm, Chrono, Timer). We hope this will help. Please contact us with further questions.